Cubic Cat Knitting Patterns | Fun & Easy Knitting Projects! scraps of black yarn for the eyes, pink yarn for the nose and brown thread for face embroidery. 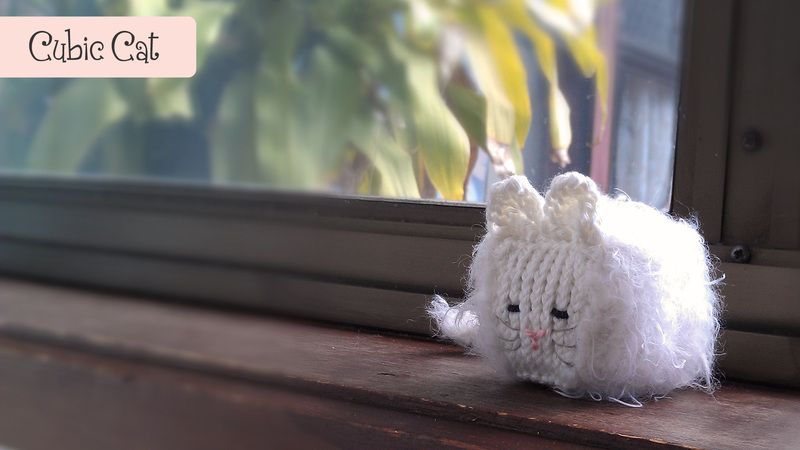 You can purch ase this Cubic Cat pattern designed by Carmen Perez D. in her blog. This pattern is super cute and very easy to make, the skills required are pretty basic. As long as you know how to knit and purl, then you will have no problem in making it. Don’t get freaked out just yet with the term St st (Stockinette stitch) as it simply means you knit one row to the end, then you purl another row to the end. At the time when I was making it, I made a mistake in choosing my yarn (the cat body is slightly bloated since the Panda yarn weight is much lighter than Lincraft Entice). Future note: select a similar weight yarn when attempting to join bodies together. With the face, I had trouble finding cat eyes / nose in shops. Lincraft had limited range and the only way for me to get them is to purchase from online shops in the USA — which means 5 weeks wait in the post! Hence I thought this will be a good chance to attempt my own face embroidery. 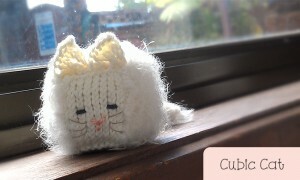 I was looking at photos of Persian cat and wanting to make my cubic cat looks similar. Lincraft Entice is the yarn I choose to produce the fur-like effect, it is a pretty interesting yarn to use though due to the hairy nature it can get really tiring on the eyes when you knit. When done, I used an old tooth brush to brush all the hair, this brings out all the hairy thread that got stuck in between and creates a really nice feel to your finished cat. baby toys, cat stuffed toys, cute amigurumi toys, face embroidery, kid toys, knitted toys, small stuffed toy, straight needles, very easy knitting patterns. Bookmark. Just wish to say your article is as astonishing. The clearness to your post is just excellent and i can assume you are knowledgeable on this subject. Well together with your permission let me to seize your feed to keep up to date with forthcoming post. Thank you one million and please keep up the rewarding work.